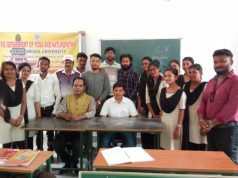 Dhenkanal: The English version of Professor Mrinal Chatterjee’s much appreciated Odia novel ‘Yamraaj No 5003’ was launched here at IIMC Dhenkanal on Saturday. 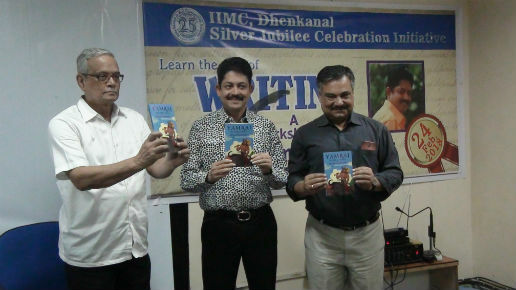 The book was launched by noted writer and CPRO of Rourkela Steel Plant, Ramendra Kumar and Professor Subir Ghosh, Principal of Bharatiya Vidya Bhavan, Kolkata in a writing workshop, organised by Indian Institute of Mass Communication (IIMC), Dhenkanal. Yamraj Number 5003 is the story of one of the thousands of cloned Yamrajs in Mrityuloka. The Yamrajs are supposed to carry out their duties like robots, but by some fluke one Yamraj—code-named #5003 has a ‘manufacturing defect’ by which he can think and feel, making him ‘different’. He begins to question the status quo, shaking the very foundation of the power structure in Devlok, making the divine trinity; Brahma, Vishnu and Maheshwar jittery. What happens when they decide to take action against the erring Yamraj? Woven with humour, this multilayered novel will move the readers as well as entertain them. Originally published in Odia and translated into Assamese, this hugely popular novel is being published in English for the first time. The English translation was done by seasoned journalist Thirumoy Bannerjee. Assamese version of his novel ‘Yamraj Number 5003’ had been released on February 22, 2016, in Guwahati. Prof. Chatterjee has also made an immense contribution to the field of fiction writing with more than 10 novels publications, 7 short story collections and a series of columns in Odia dailies. His Odia fiction ‘Jagate Thiba Jate Dina’ published in 2010 has gained immense popularity among the readers in Odisha. The book is a collection of his columns published in the weekly Samaja Saptahiki. His novel ‘Kandhei’ released on 15 December 2013, has also got positive reviews as the book not only breaks many myths about cats but also make the readers see the world through the eyes of a cat. His latest novel ‘Eka Sundar Chandini Ratire’ has been published by Shraddha Publication, Baleswar in March 2016. It is Dr Chatterjee’s seven short story collection. His sixth short story collection ‘ Yamraj Chutire’ (Yamraj on Leave) has been released on December 12, 2015, at Rajdhani Book Fair. It is published by Bhubaneswar-based Timepass Prakashan.